Once again we have entered upon a new year welcomed with wild celebrations at midnight, December 31. Such festivities are questionable at best. And why celebrate the reminder that, just as a year has vanished into the past, so all too quickly must our earthly lives pass as well? That fact should bring sober contemplation and prayer rather than loud rejoicing. Time passes and cannot be recalled. The poet wrote of her memory running “like a hunted thing down paths I cannot retrace.” Time is mysterious, beyond our ability to fathom. We know some things about time, but what it really is eludes our most advanced science. Essential for change and motion in the physical universe, time will be absent in eternity. Nothing changes or ages in eternity; it is one eternal now , impossible for us at present to comprehend. Won’t we travel in eternity across the universe, necessitating time? Not as we understand “travel.” Space as a measurement of distance between places or objects may no longer exist, or at least it will lose its meaning. There will be millions of redeemed in heaven. Will some therefore be far from Christ on the fringes of the vast throng? In fact, all will be in His immediate presence—a joy beyond our current understanding. Already in the Millennium, our resurrected, glorified bodies, like Christ’s, will no longer be part of the physical universe and will thus be changeless and timeless, able to be seen, then vanish, and to pass through closed doors and walls. “Jesus himself stood in the midst of them...but they were terrified...[thinking] they had seen a spirit....[H]andle me, and see,” said Christ, “for a spirit hath not flesh and bones, as ye see me have” (Lk 24:36-43). Paul informs us, “There is a natural body, and there is a spiritual body” (1 Cor:15:44). We don’t know what that means except as it was demonstrated in Christ’s resurrection. Without His resurrection there is no hope for eternity. Yet Christ’s triumph over death, the very heart of our faith, is denied by some who claim to be in the faith. The Evangelical Lutheran Church in America (ELCA) considers it no longer essential to believe that Christ rose from the dead. 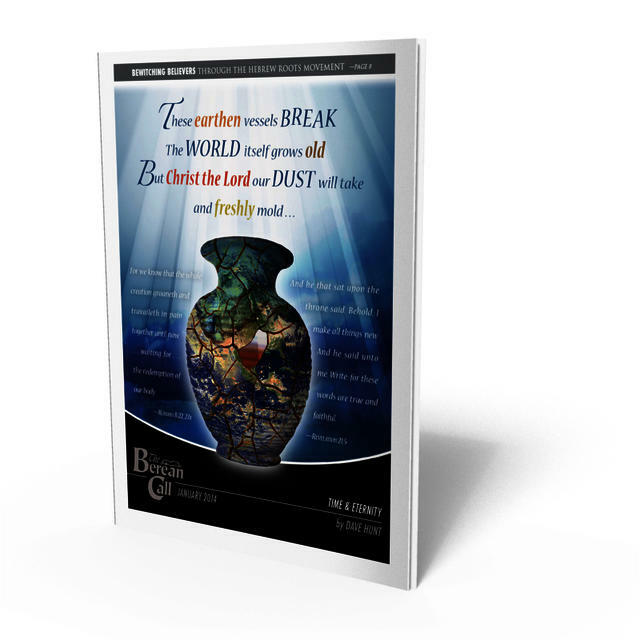 A book recently published by the Augsburg-Fortress Press of the 5.6 million-member ELCA, by Professor Gerd Luedemann, comes to the conclusion that the body of Jesus decayed in the grave. The apostles, then, were liars because they testified that Christ rose from the dead and “shewed himself alive...by many infallible proofs” (Acts:1:3). Who was this imposter, with nailprints in hands and feet and a spear wound in his side, who spent 40 days with the disciples and convinced them that he was Jesus come back from the dead? The grave was definitely empty. It is ludicrous to imagine a “body snatcher” emptying a tomb that was being guarded by Roman soldiers! Moreover, if Christ is not risen then Christianity is just another philosophy of life like Buddhism or Confucianism. In fact, it would be worse because Christ himself promised that He would rise from the dead, that because He lived so would His disciples, and that one day He would come back to take them to heaven. Unlike Buddhism or Hinduism or Islam, whose leaders made no such claims, if Christ didn’t resurrect, He is a liar and Christianity a fraud! Our very salvation is dependent upon believing that Christ rose from the dead: “[I]f thou shalt confess with thy mouth the Lord Jesus, and shalt believe in thine heart that God hath raised him from the dead, thou shalt be saved” (Rom:10:9). Muggeridge’s book gave me one of my earliest perceptions that some who reject the very heart of Christianity pretend to be His true disciples and thus destroy Christianity from within. I was learning, to my dismay, that the “last-days apostasy” is upon us and gaining alarming momentum. Our calendar supposedly marks the years since the birth of Christ. Elaborate plans are being laid to celebrate Christ’s 2,000th birthday in the year A.D. 2000. In fact, we reach that milestone in 1996 due to a four-year miscalculation in starting the calendar. Christ was actually born in 4 B.C. There is no more reason, however, to celebrate his 2,000th “birthday” than there was to celebrate his 1,999th or any other. He changes not. There is another side to that coin. While the realization that the discomfort must inevitably end is heartening when one is in the dental chair, it has the opposite effect when one is enjoying a vacation. As surely as pain will pass, so will pleasure. And so it is with one’s entire life, which, no matter how lengthy, is like “a vapour, that appeareth for a little time, and then vanisheth away” (Jas 4:14). That simple fact is forgotten by most of us most of the time. Plans are usually laid as though life on this earth will never end. Solomon said, “It is better to go to the house of mourning [a funeral], than to go to the house of feasting: for that is the end of all men; and the living will lay it to his heart” (Ecc:7:2). Does this sound morbid? It surely refutes the idea that one must always be “positive”! Moses put it like this: “So teach us to number our days, that we may apply our hearts unto wisdom” (Ps:90:12). Thus, true wisdom involves a recognition of the shortness of our days upon earth. The fact that this life (no matter how successful and full of pleasure or how painful and difficult to endure) passes, and that eternity never passes, must temper all of our choices. Without that reminder we would live for time (with which we are too absorbed) rather than for eternity (to which we scarcely give a thought). Yes, we need to make prudent decisions pertaining to this life. Every decision, however, must be made in light of eternity. A choice that weighs only the consequences for time and produces detrimental effects for eternity is the utmost folly. Jesus warned that to “gain the whole world” is not success but the worst failure imaginable if such earthly gain is made at the cost of one’s soul, i.e., one’s eternal destiny (Mk 8:36). The changing of the year is the time when “New Year’s resolutions” are solemnly sworn, promises are made, hope springs once again and optimistic plans are laid for the year ahead. In his classic book, A Serious Call to a Devout and Holy Life , William Law mentions two men, each completely absorbed in planning a retirement mansion. One plans to build his on earth, the other on Mars. Everyone thinks the second man is a fool. Law, however, shows that they are both fools and that the difference in the degree of their folly is only a short period of transient time. The one plans a house on Mars where he will never be ; the other on earth where he cannot stay . This is not to suggest that we should not plan for this life. No plans, however, for retirement or even for tomorrow, should be made without submitting them to God’s will. As James has written, “Go to now, ye that say, To-day or to-morrow we will go into such a city, and continue there a year, and buy and sell, and get gain: whereas ye know not what shall be on the morrow....For that ye ought to say, If the Lord will, we shall live, and do this, or that. But now ye rejoice in your boastings: all such rejoicing is evil” (4:13-16). You look upon me with pity, not that I am going unprepared to meet the Judge of quick and dead, but that I am to leave a prosperous trade in the flower of my life....And yet what folly of the silliest children is so great as this? If I am now going into the joys of God, could there be any reason to grieve that this happened to me before I was forty years of age? Could it be a sad thing to go to heaven before I had made a few more bargains or stood a little longer behind a counter? And if I am going amongst lost spirits, could there be any reason to be content that this did not happen to me till I was old, and full of riches? What a strange thing is it that a little health or the poor business of a shop should keep us so senseless of these great things that are coming so fast upon us! Compromise may be more difficult to resist even than sensual sin—and it is becoming increasingly necessary to compromise to retain the favor of today’s evangelical leadership. The very correction that the Bible requires is no longer acceptable. Yet everything else must be accepted. The following fax arrived at this very moment from the former host of a Christian radio talk show: “Our show was cancelled...on Oct. 6 amidst a tremendous protest from listeners....A couple of weeks ago [my replacement] did a show on false teachings....Promise Keepers came up [from a caller], caused the usual flap...management hauled [him] in for a dressing down and pulled him from the show....As a 30-year pro in broadcasting, I can see ‘Christian’ broadcasting locking into a religiously correct format...and that is tragic for the body as a whole. The effort to smash free speech and thought is worse in religious media than in secular.” We have lost the vision of eternity, and heaven has become the place everyone wants to go—but not yet. ). John encourages us, “when he shall appear, we shall be like him; for we shall see him as he is” (1 Jn:3:2). Again Paul holds before us a hope that makes earth’s best alternatives shrink into nothingness: “Looking for that blessed hope, and the glorious appearing of the great God and our Saviour Jesus Christ” (Ti 2:13).